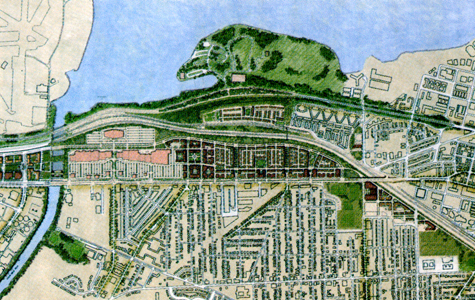 Potomac Yard in Alexandria, VA was abandoned for more than ten years, while unsuccessful efforts were made to plan the former railroad switching yard. In 1998, the property’s new owner selected Cunningham | Quill Architects to spearhead an interactive community design process. CQA led an interdisciplinary team in developing a master plan that achieved a new vision for Potomac Yard. After 20 community outreach meetings held over 16 months, the team gained consensus on a new master plan. The success of uniting the community led to a unanimous vote of approval by the City of Alexandria Planning Commission and City Council on the Potomac Yard Master Plan. The Potomac Yard Process provides a framework of engagement built on effective communication with the community. 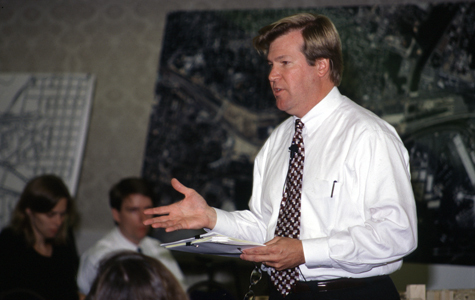 Lee Quill leading one of the community outreach meetings that led to the plan’s success. The new infill plan created 5 compact, mixed-use and pedestrian-focused neighborhoods and town center focused on transit stops. A connected open space system links a network of smaller neighborhood and new larger city-wide parks throughout the plan, which locates residents within a 5-minute walk of any major park. Informed by the historic street and grid patterns of the adjacent Old Town and Del Ray neighborhoods, the street and block pattern provides neighborhood-serving retail and a major town center at the north end of the site. Higher density commercial and residential buildings are located near existing and potential transit stops, while taller buildings are placed along major street corridors and within the town center. 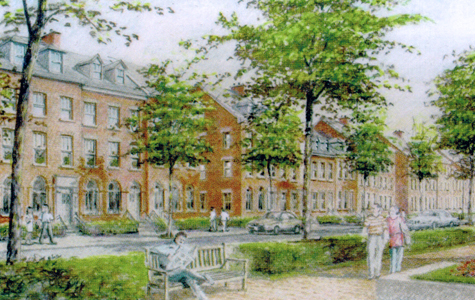 The Potomac Yard process received extensive recognition as a model for engaging communities. It was the subject of one of the first EPA Smart Growth Speaker Series lectures at the National Building Museum, and it has been written about in numerous publications including Planning Magazine, Urban Land and Inform Magazine.